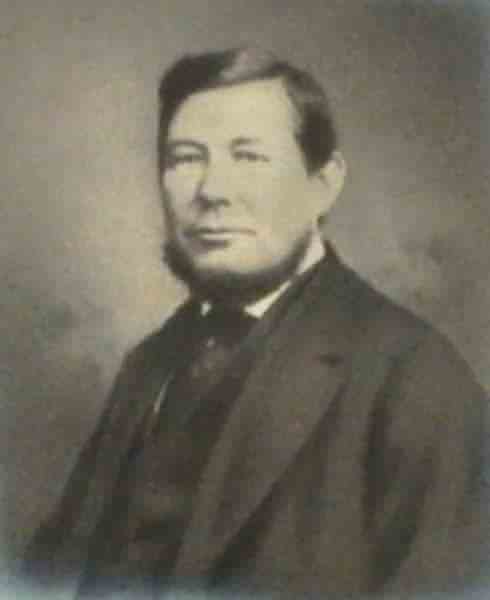 John W Hill was born in Worcester around 1823. His parents are unknown. He was married to Charlotte (probably in 1845 to Charlotte Hyde) and they were to have five children; John William (b1849), Anne Elizabeth (b1850), William Russell (b1854), Charlotte Ellena (1856-1909) and Catherine Maud (1859-1948). The first two children were born in Hackney, London, but the family moved to Yeovil around 1852 where the three younger children were born. In 1854 John became partners with William Bide Jnr and the Western Flying Post reported on the new firm that had been formed in Back Kingston (today's Higher Kingston) called Bide & Hill. In its edition of 11 February 1854 the Wells Journal reported on the opening of the "new and extensive" premises of Bide and Hill in Back Kingston. Their new premises were 142 feet long, 42 feet wide and 50 feet high (see Gallery). In the 1861 census John and his family were listed in Reckleford - in fact they were living in Devonshire Cottage in Pound Close (see map). He gave his occupation simply as 'Glove Manufacturer'. Although William Bide died in August 1864 the firm of Bide & Hill continued to use the name and was listed in the 1875 edition of the Post Office Directory as "Bide & Hill, Glove Manufacturers of Reckleford". In the same directory John was listed as "John Hill, Glove Manufacturer of Higher Kingston". The family were still living in Devonshire Cottage in 1871 when John gave his occupation as "Glove Manufacturer of the Firm of Bide & Hill employing from one hundred to one hundred and fifty Males and Females on the Premises". John spent many years in local politics. 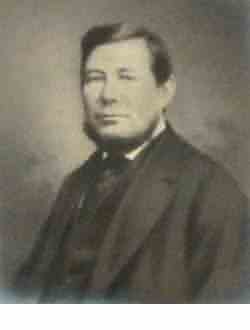 He was elected to the Borough Council and served as Mayor of Yeovil from 1874 to 1876. In 1888 he was appointed as a Borough Magistrate. In the 1881 census John and Charlotte, together with children William, Charlotte, Catherine and a servant were listed at Devonshire Cottage - the only time the cottage was named in a census. By this time Bide & Hill was no more and it seems that John now had his own company, albeit smaller. He gave his occupation as 'Glove Manufacturer, 18 men 1 Boy. Town Councillor Borough of Yeovil'. John also owned a farm in Bitham, Wiltshire, where the family also spent a lot of time. John Hill died in Yeovil on 23 March 1889. He was aged 66. 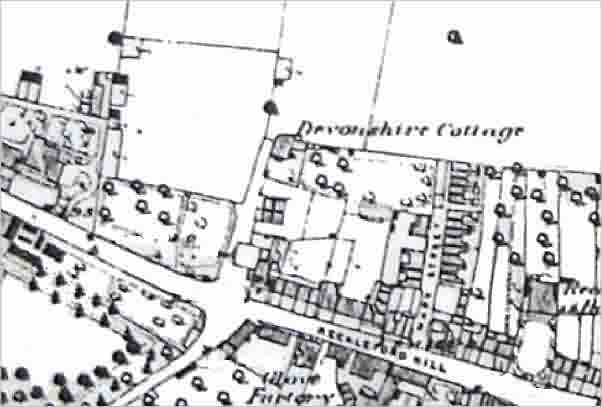 A portion of the 1889 Ordnance Survey map showing John's home, Devonshire Cottage, at centre. The lane it stood in, Pound Close, would be developed as The Avenue and the cottage itself would later be known as Whitefriars. A report in the 11 February 1854 edition of the Wells Journal concerning the opening of the new premises of Bide and Hill in Back Kingston. A brief report of a robbery from Bide & Hill's glove factory, Kingston, from the 12 February 1867 edition of the Western Flying Post. 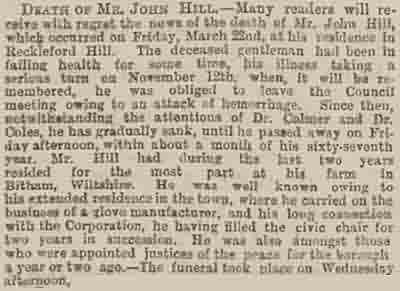 John Hill's obituary from the 29 March 1889 edition of the Western Gazette. This page last updated 8 October 2017.